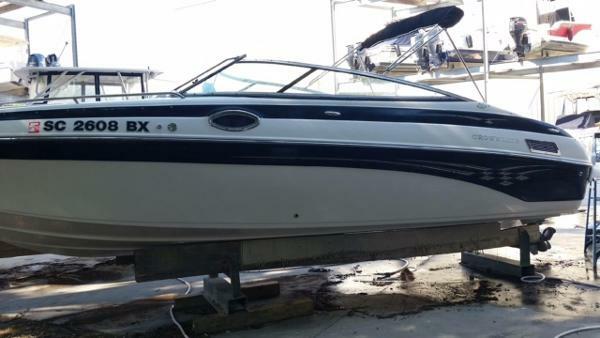 2007 Crownline 270 BR This boat is in great shape! 141 hours on the Mercruiser 350 MAG MPI (300hp). Meticulously maintained by the single owner. Upholstry, canvas, gelcoat, are in great shape. Many additional factory items including Motor Flush Kit Trim TapsGarmin GPSSony Stereo with swim platform controlMarine Pump Out HeadSink and Fresh Water Swim Platform ShowerYacht CertifiedRemoval TableTubes/rafts and other accessoriesSelf activating fire extinguisher systemNew boat coverFull Bimini Just detailed and a fresh coat of wax. More pictures to come. She won't last long! 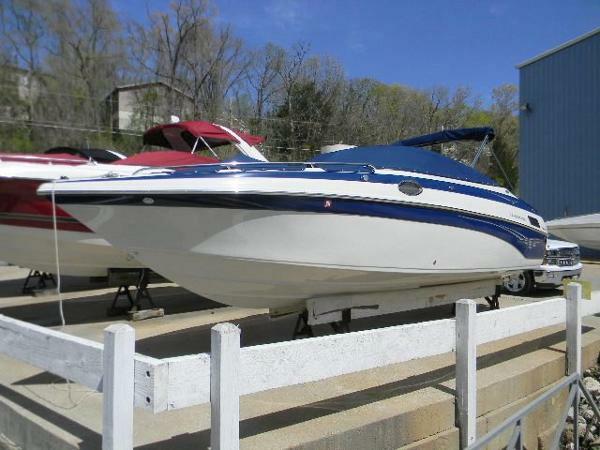 2004 Crownline 270 BR This 2004 Crowline 270 BR is in Great condition and is completely ready to turn the key and have a great time on the lake. It has a 375hp 496 Mag Mercruiser Bravo III motor with only 134 hours. Comes complete with Bimini top, boat cover, cockpit cover, bow cover, Silent choice exhaust, closed loop cooling system, portable cockpit table, two built-in coolers, pressurized water system w/ 20 gallon holding tank, dual batteries w/ switch, trim tabs, woodgrain kit, Kenwood stereo w/ Bluetooth, Rockford Fosgate 10" woofer and much more. This boat does come with an aluminum tandem axle trailer which has an electric trailer jack and surge brakes. 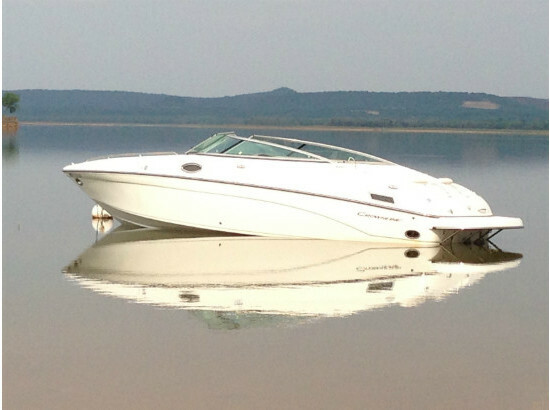 Now is the time to buy before the season comes back and this beautiful boat is gone. 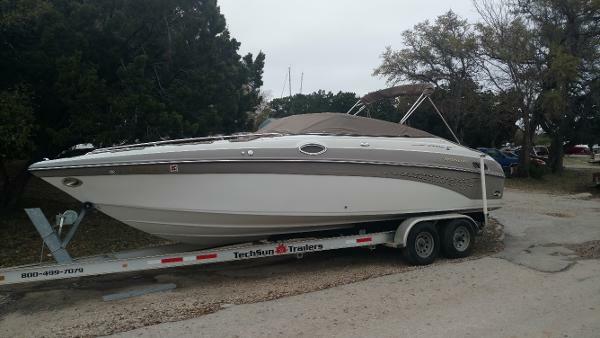 If you are interested in viewing this boat please contact us at Canyon Lake Marina and we will be happy to make an appointment with you. 2003 Crownline 270BR Bimini Top Full Deck Cover Freshwater Sink w/console Duo Stainless Steel Prop Snap in/out carpet Porta Potti Custom ordered motor produces 425 HP Fuel Injected Relco Crownline Tandem Axel trailer w/diamond plate step plates & Disc Breaks Bow filler cushions Depth finder w/transducer Upgraded Bouster Seats Woodgrain Dash & wheel with knob Sony head unit w/6 Sony Speakers Batteries w/dual switch Docking lights 295 hours! 2007 Crownline 270 BR 2007 Crowline 270 BR with a Mercruiser 496 Mag 375 HP engine (only 204 hours...1 owner) with Bravo 3 stern drive and twin stainless steel props. Side hull graphics with thru hull exhaust, captains call, trim tabs with trim meter and docking lights. Extended swim platform and carpet with colapssible swim ladder and bimini top. Snap in capets and custom fit snap on boat covers. Buit in head and sink with 20 gallon fresh water tank and dual battery switch. This boat is in perfect shape inside and out. Interior and exterior are showroom quality. Always dry storage kept and put away clean. Price includes boat and tandom axel painted trailer with surge brakes and custom chrome wheels. All 4 tires are only 4 months old. 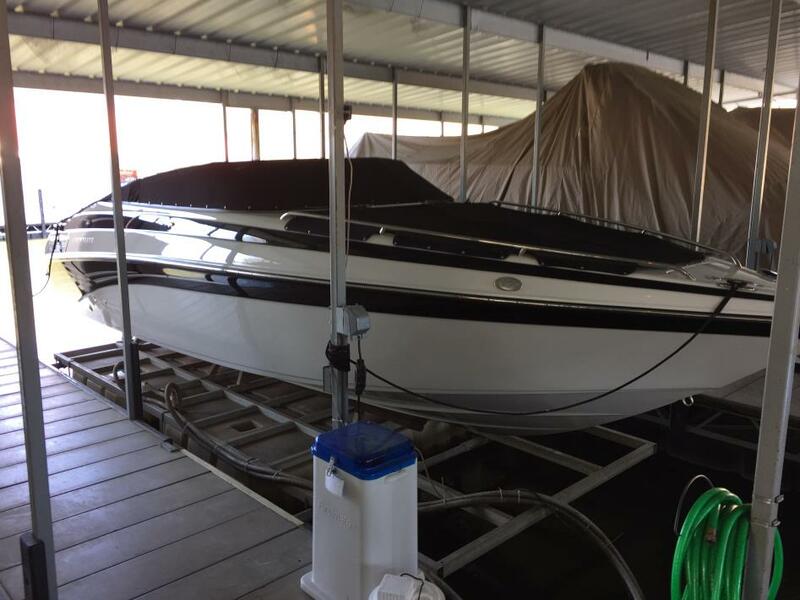 All summer make ready service has already been performed and this boat is ready to be dropped in the water and go all summer long! Price is negotiable but already several thousand dollars below the book value. You have to see this boat to truly appreciate the great condition it is in. 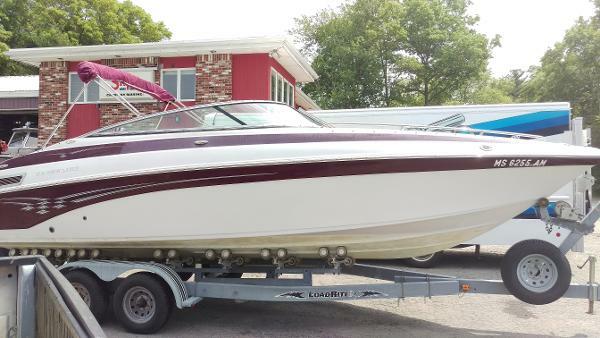 2006 Crownline 270 BR I am selling our 2006 270 Crownline bowrider. This boat is in excellent condition inside and out. There are no rips or tears in the seating. Interior is white with black accents. Exterior still shines like new with no chips or scratches. 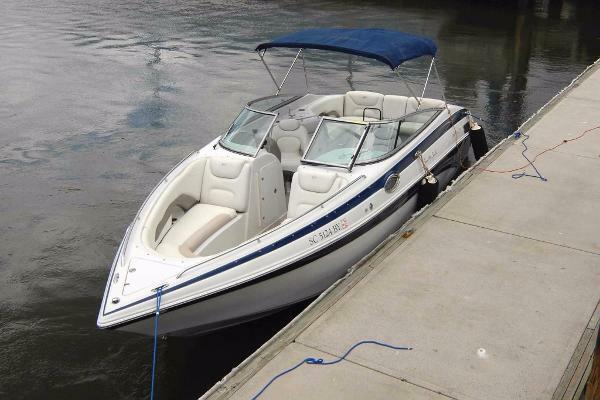 Some of the features on this boat are:- snap out carpeting, in great condition with no stains or rips. - black bimini top- delta anchor with rope and chain- wet bar and sink- center walk thru at transom- u-shape seating in the cockpit- 2 captains chairs- front and rear filler cushions- trim tabs- porta potty head, which has never been used- bow and cockpit cover as well as full winter cover- tons of storage- 2 new batteries installed 07/15. 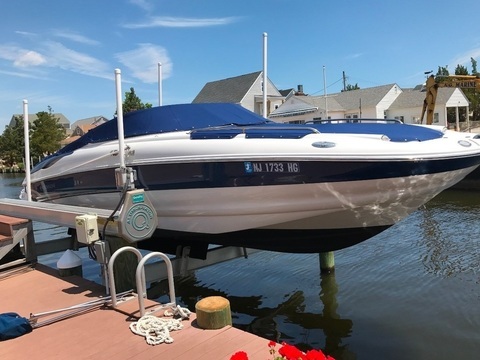 - In 2015 had a professional install an onboard charger system as well as a new stereo (Kenwood head unit and 6 polk audio speakers along with polk audio sub and amp as well as wireless remote at transom). - It has the Mercruiser 350 mag engine with the bravo 3 drive with SS props- It has only 330 hours. Professionally maintained; oil change every year, lower unit serviced every 2 years. Waxed spring and fall. Always wiped down after every use and always on a lift when not using. Smooth riding boat, even on the busy weekends. Located at Lake of the Ozarks, MO. Asking $39,900. Call Ryan at 314-686-9053 with any questions. Thanks. 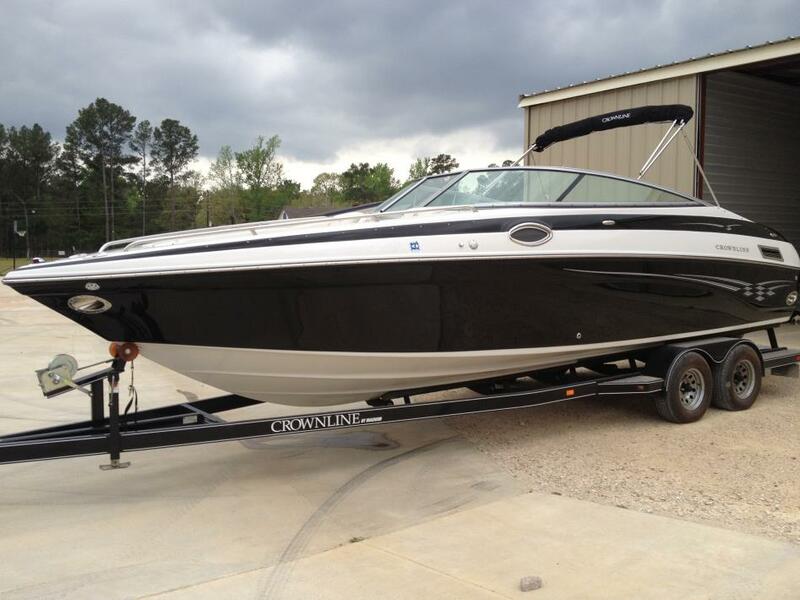 2005 Crownline 270 BR Just arrived! 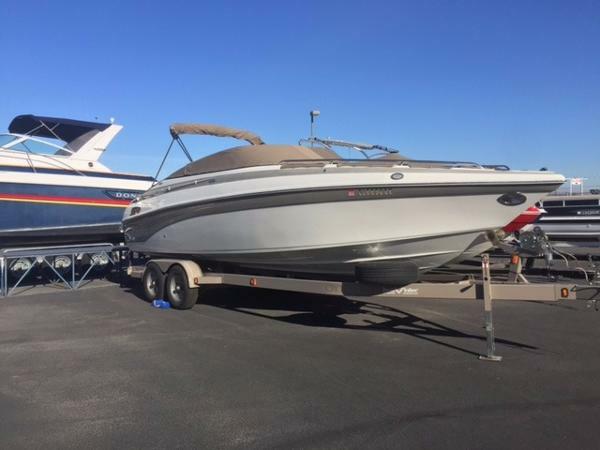 Very nice large open bow sport boat at BoatingLakeMead's showroom in Las Vegas, NV. Spacious, powerful, and ready for the water! 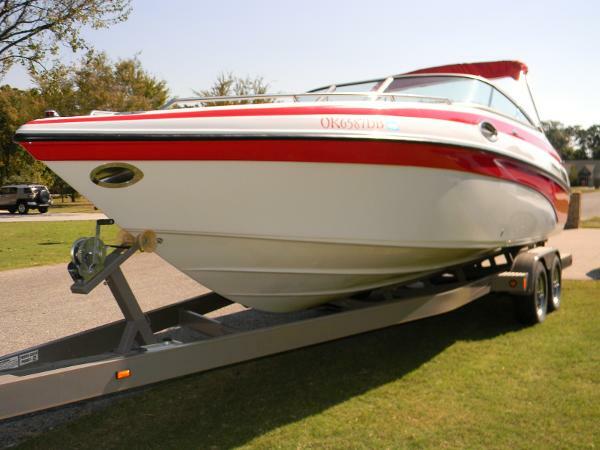 This 2007 Crownline 270 bowrider is in very nice condition and well maintained! Powered with the Mercruiser 350 MAG - Bravo III. Options include: snapping bow and cockpit covers, large bimini top w/ boot, seperate head compartment with porta potti, VHF radio, dual batteries and much more. Includes matching painted tandem axle trailer with spare tire. Call today and start enjoying tomorrow! 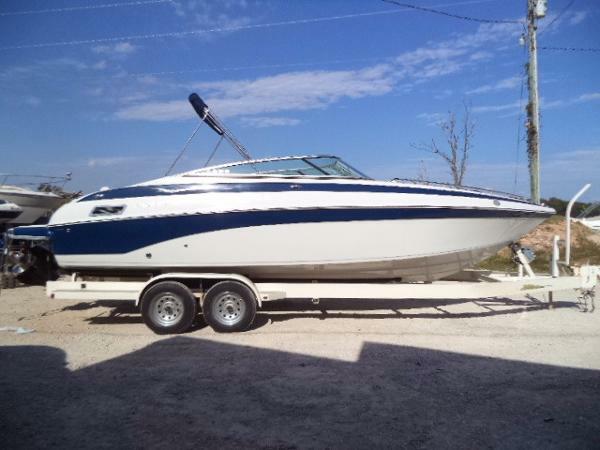 2006 Crownline 270 BR Just in is this one owner 2004 27' Crownline bowrider 270BR. Powered by a single 300hp Mercruiser Fuel Injected 5.7L with a Bravo III dual prop outdrive and only 217hours. ALWAYS dealer maintained from day one. This one you don't want to miss. Options include: Porta Potty with pump out. Sink in head compartment, bow filler cushions, cockpit sink, ski locker, extended platform, transom shower, bimini top, Bow and cockpit covers, tilt steering wheel, dual flip up bucket seats, depth sounder, Cockpit table, dual batteries with switch, and more 2004 Load Rite Galv, roller, tandem axle included Full specs and pictures coming soon. 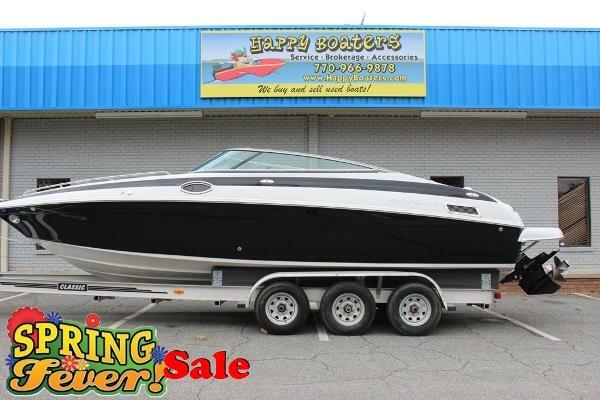 2007 Crownline 270 BR akin to Sea Ray SLX If you are looking for a large bowrider boat on a budget, this is your boat. The 270 has a very large bow area and wrap-around seating in the cockpit. Add two nice bucket seats for the captain and one companion and you get a party boat that will hold up to 12 people. The boat includes a head with a pump-out toilet, freshwater sink, opening porthole, exhaust vent with a door for privacy. This boat includes a Bimini top with full canvas enclosure. The low hour Mercruiser 6.2L engine has 320 hp. Enough to get the boat up close to 45 knots at full speed. Call for an appoinment today. This boat will not last. 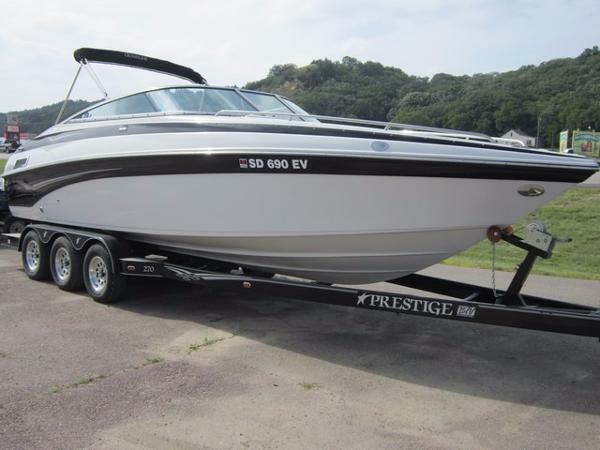 2007 Crownline 270 BR The 270 boasts of abundant standard equipment that will meet, if not exceed, all expectations. First there's the Tri-Tech buckets up front. Then, the fresh water wet bar, built-in coolers, a lighted portable toilet enclosure with vent and sink. All the way back is the extended swim platform and center entry walk-thru transom. It's all wrapped up in our Armorcote gelcoat finish and topped with a handsome stand up bimini cover. 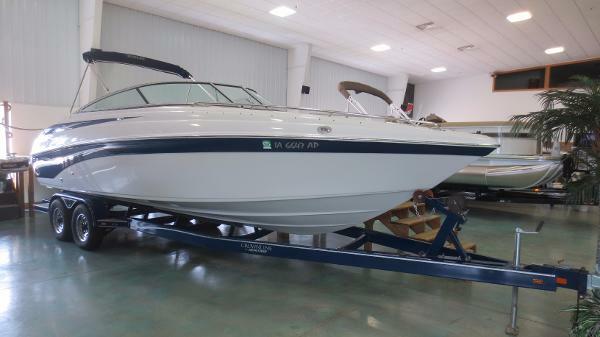 2005 Crownline 270 BR, This is a one owner fresh water boat. 394 hours....NO TRAILER! Powered with a Mercruiser 350 MAG MPI, Bravo 3 (dual prop). GPS,snap-out carpet, pump-out head, bow and cockpit cover, bimini top, stereo, dual batteries w/ switch. 24 degree bottom, great running boat for the lake! Yacht certified.